Bonding of hot mix asphalt (HMA) overlays is a key component of making pavements last. Debonding can cause early failure of a pavement, resulting in significant cracking and repair costs. Traditional paving techniques of a distributor spraying a small amount of tack in front of a paving operation, waiting for it to break, and then driving the entire paving process (several haul trucks, shuttle buggy, paver etc.) over the tack often results in a majority of the tack being removed from the roadway. This in turn often causes a poor bond between the previous surface and the new HMA overlay. 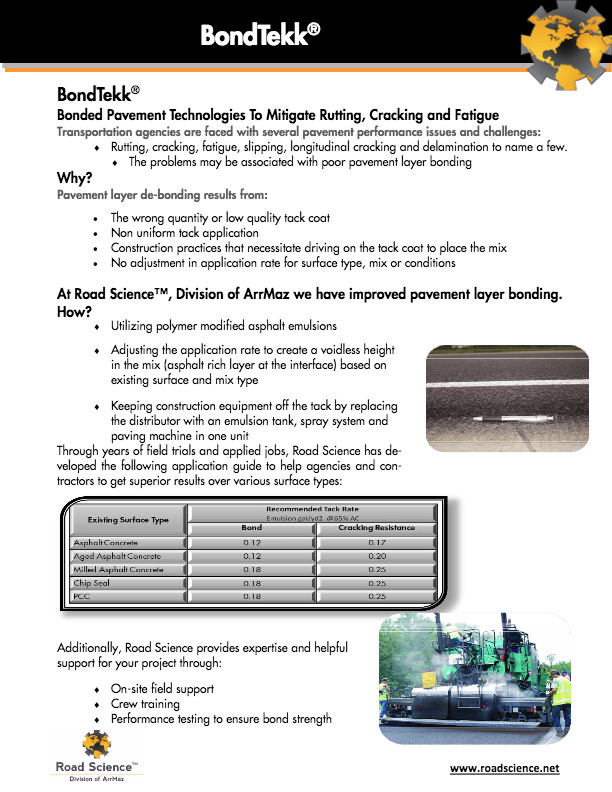 With Road Science’s BondTekk® bonded pavement technology, you can now create a better bond between pavement lifts that was never before possible. Utilizing a spray paver, agencies can now specify a higher quality polymerized tack coat applied at application rates of 4 to 6 times higher than traditional methods. This is achieved using a spray paver which combines the distributor and paver equipment into one machine, thus eliminating tracking away of the tack coat by construction vehicles. This increase in bonding liquid not only creates a better bond, but also provides a stress-absorbing membrane that significantly delays cracking in the new HMA overlay. BondTekk has been successfully used on overlays over both concrete pavement and HMA surfaces. All types of mixes can be used in this process including dense graded super-pave mixes, stone matrix asphalt (SMA), open graded friction course (OGFC) and gap graded mixes. 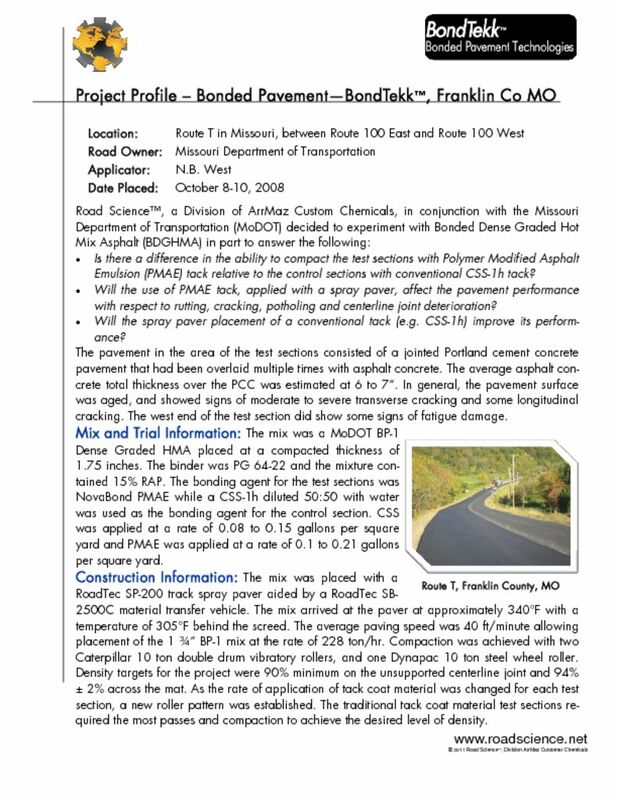 Studies from multiple projects in Kansas and Missouri show that after 7 years of service life, the BondTekk-applied HMA had 73% less transverse cracking and a whopping 83% less longitudinal cracking versus the conventional paving process (distributor truck applied tack). Over 100,000,000 square yards of spray paver HMA has been applied in the US over the last 19 years including many using Road Science’s BondTekk technology with dense graded mixes. Longer lasting HMA is now a reality with the use of BondTekk technology offering substantial life cycle cost savings to agencies.